Old reliable trustworthy Landcruzer, shifts and runs great no leaks anywhere, no visible rusts. No locking differential on this one.Can be driven cross country with confidence and gass money! 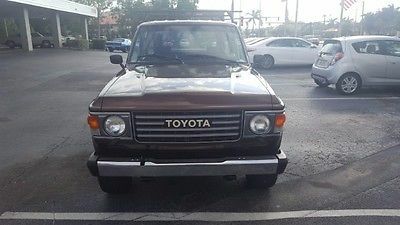 Exotic Sports Cars 1150 South Federal Highway | Pompano Beach, FL 33062 | 954-942-3151 Vehicle Inquiry Payment Information Shipping Information Terms & Conditions My eBay Profile 1984 Toyota Land Cruiser FJ60 Vehicle Information: Mileage: 152,534 VIN: JT3FJ60G9E1108727 Engine: 0 Cylinders Transmission: 4 Speed Drivetrain: 4WD Exterior Color: Brown Interior Color: Brown Stock #: 108727 Location: FL Contact Information: George Arthur 1150 South Federal Highway Pompano Beach, 33062 954-942-3151 Vehicle Description: The Toyota F series engine was a series of OHV inline-6-cylinder engines produced by Toyota between 1955 and 1992.No rust anywhere on vehicle as this vehicle has been completely restored, has new paint, frame painted looks like new as this was a frame off restoration. No accidents that we are aware of as this vehicle looks like it was new off the line underneath and the paid job. All gears work perfectly as we just replaced the clutch with a new one last week so that is also new. As to repairs needed. The radio needs the antenna replaced as when it was stripped down someone forgot to re-install the antenna. Photos: Payment Information: We accept cash, cashiers-check, and certified funds.Successful "winning" bidder must contact us within 24 hours after the auction has ended to verify purchase and make arrangements to complete the transaction. Within (5) business days of the end of auction, full payment must be received either by cash payment, cashiers-check, or certified funds. If funds are not received, and an alternate arrangement has not been made, the vehicle can and will be made available to other potential buyers on a first-come, first-serve basis. Shipping Information: Please understand that it is the Buyer’s responsibility to arrange shipping. We are NOT the shipping company. All shipping questions and/or concerns should be addressed directly with the shipping company used to transport said vehicle. Should you need assistance in locating a shipping service, please let us know! We aim to recommend only quality vendors. Terms & Conditions: All vehicles are sold "as-is" and without warranty. Some vehicles will have factory warranty remaining (will be stated in our description). Online Bidders are entering into a legal and binding contract to purchase the vehicle described above. If you do not intend to purchase this item, please DO NOT BID! We reserve the right to cancel bids and/or our auction at anytime for any reason. 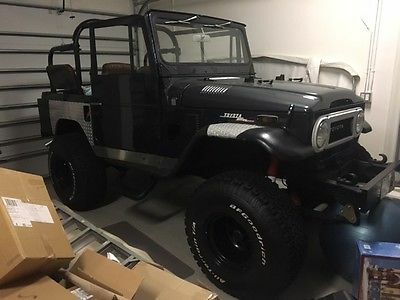 Awesome FJ40 project with lots of extra parts. Frame is ready to go with POR 15 already applied. Brand new BF Goodrich 33x10.50 15's and brand new wheels. New floor pans (not installed) Rust in passenger side rocker, front fenders in very good shape. Tub needs work. Extra tub top channels salvaged from a donor FJ, as well as rear wheel wells. Two fiberglass tops (One needs fiberglass repair, other one in good shape). Top sides in very good condition. New clutch, pressure plate, and throw-out bearing. New Energy Suspension body mount kit. New mirrors. Front seat tool box. Very good top dash pad. Roll bar with extra set of pads. Extra transmission and transfer case. Extra 31 spline steering box and shaft. 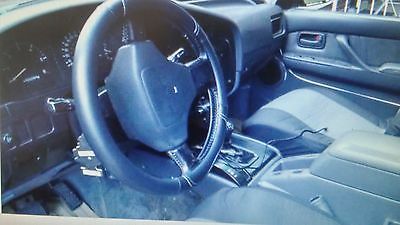 Extra steering wheel, front heater, and radiator. Many other parts are included that are not pictured, about every part to finish except seats. Engine ran when parked. Clear title. Feel free to ask if any further info or pics are needed. Perfect project with tons of potential. I just don't have the time or funds to finish it. Two roads diverged in a wood and I - I took the one less traveled by, and that has made all the difference. 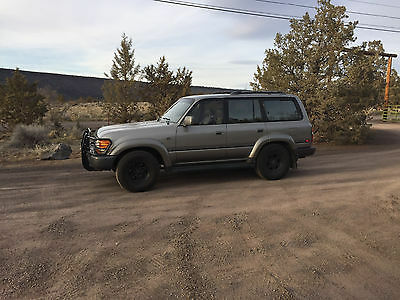 - Robert Frost This Landcruiser has been a solid friend to my many travels. With only 2,100 miles on a new transmission, which is still under warranty 12 months 12000 miles, it's a great car. 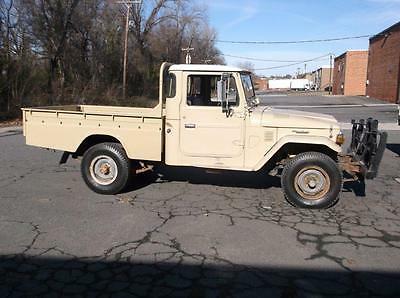 It has a new muffler, new back brakes, new alternator, great tires and only 3 little specs of rust by the wiper blades (see photo) and a crimp in front tow hook bumper (see photo). I have every maintenance record as well as the other 2 head rests that are not shown in photos. It is smoke free, pet free, with a very clean head liner, grey sheep skin bucket seat covers in front and a protective durable matt in back. AC blows cold, heater blows hot, CD/radio after market and comes with installed tow pkg and a hefty durable removable hitch. It's a great car! I have had it for a long time and love it dearly. 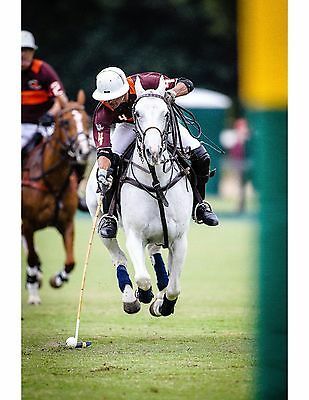 Am a professional polo photographer and found it perfect for camping, storing my gear, shooting photos from inside in the back while it rained outside, and moving my stuff when it was time to pack up and follow the high goal polo circuit. It has a ton of room and I love the tinted windows, so easy to see out on sunny days while keeping the interior cool. I don't need to tell you this but, they don't make these anymore and if you have always wanted one, now is the time. This car is a classic with fewer and fewer remaining road worthy. I get stopped all the time by folks telling me how much they love it. It won't take long to sell. Call with questions, but hurry. I go to a car Auction soon. Would love to see it go to a good home. 561.662.0072 Treat it right and she will last forever! 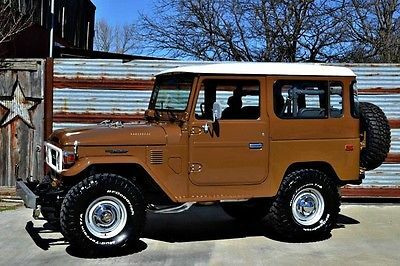 1974 Toyota Land cruiser---Complete restoration !!! 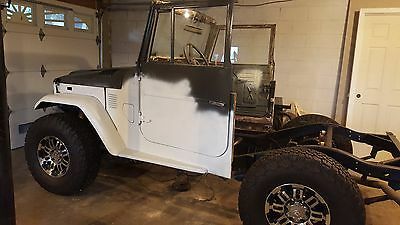 Mechanical , paint & body , suspension , brakes , power steering & more !! All receipts , over $10,000 spent on recent maintenance / upgrades. 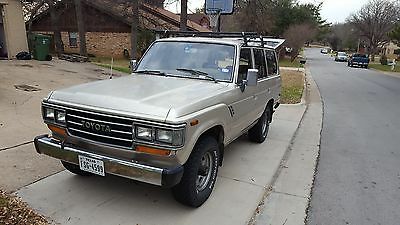 1980 Toyota Land Cruiser LAND CRUISER TURBO DIESEL 1987 TOYOTA LAND CRUISER 60 SUV 4X4 TURBO DIESEL HJ61 LOW MILES !!! 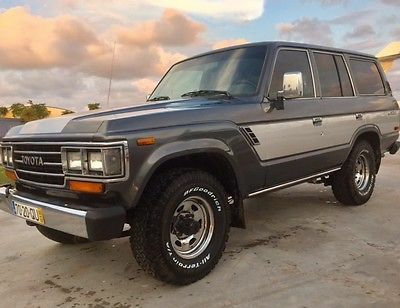 BEAUTIFUL, RIGHT HAND DRIVE, 1987 TOYOTA LAND CRUISER 4X4 WITH 4.0L TOYOTA TURBO DIESEL ENGINE AND AUTOMATIC TRANSMISSION WITH ONLY 197K MILES (317,129 KM). 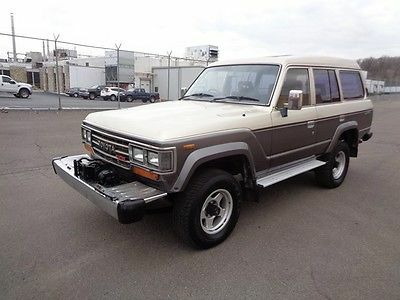 THIS LAND CRUISER WAS LEGALLY IMPORTED FROM JAPAN. THE EXTERIOR AND INTERIOR BOTH IS IN VERY GOOD CONDITION !!! CLEAN INSIDE AND OUT !!! HAS FRONT AND REAR DIFFERENTIAL LOCKS, HEAVY DUTY WINCH, MONROOF, POWER WINDOWS, POWER DOORS AND MUCH MUCH MORE. MECHANICALLY THIS SUV IS IN GREAT CONDITION !!! THE ENGINE RUNS PERFECT AND AUTOMATIC TRANSMISSION SHIFTS SMOOTHLY !!! 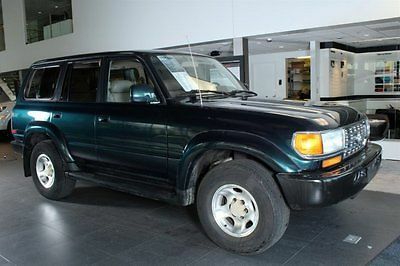 VERY DEPENDABLE AND ROAD WORTHY SUV. JUST TURN THE KEYS AND GO ANYWHERE !!! DON'T MISS IT !!! THIS IS A VERY HARD TO FIND SUV !! !VIN# HJ61006438BEST DEAL !!! BEST DEAL !!! BEST DEAL !! !NO BEST OFFERS !!! PRICE WAS LOWERED FOR A QUICK SALE !! !THIS IS A BUY IT NOW ONLY AUCTION !! 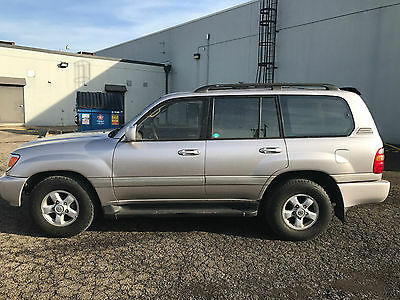 !LOCATED IN MORRISVILLE, PA 19067Terms & Conditions:This vehicle is being SOLD AS-IS, where is with no warranty, expressed written or implied. This is a buyers responsibility to make all transportation arrangements. Please don't bid if funds are not available at the time of bidding. Pennsylvania buyers must pay sales tax and tag fees. Out-of-state buyers are responsible for their own taxes in their own states. FULL PAYMENT MUST BE RECEIVED IN 3 DAYS !!! WE ACCEPT CERTIFIED BANK CHECK OR BANK TO BANK WIRE TRANSFER !!! NO PAY PAL !!! BUYER MUST CONTACT US WITHIN 24 HOURS AFTER THE AUCTION IS END !!! 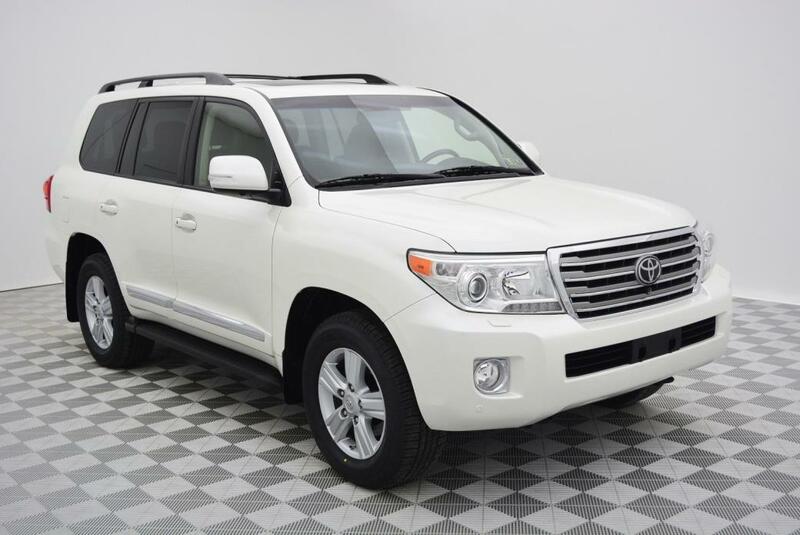 2013 Toyota Land Cruiser This auction is for a 2013 Toyota Land Cruiser in Blizzard Pearl. Very clean Certified Toyota. Buy this one with the confidence and backing of Toyota Certification. EXTERIORHID Headlamps w/ LED Accent, Fog Lamps, Windshield Wiper De-Icer, & Pwr MoonroofSAFETY & CONVENIENCEStar Safety System: Vehicle Stability Control (VSC), Active Traction Control (A-TRAC),Multi-Terrain 4-Wheel Anti-Lock Brake System (ABS) with Electronic Brake Force Distribution (EBD), Brake Assist (BA) & Smart Stop Technology (SST)Dr & Fr Pass: Advanced Airbag System, Knee Airbags, Active Seatbelt Pretension -ing System & Active Headrests; Dr & Fr Pass & Second Row Outboard Seat-Mounted Side Airbags; All Row Roll-Sensing Side Curtain Airbags (RSCA) w/ Cutoff SwitchLATCH-Lower Anchor & Tether for CHildrenChild-Protector Rear Door LocksFront and Rear Parking Assist SonarDynamic Radar Cruise Control (DRCC)Pre-Collision System; Trailer Sway CtrlRain-Sensing Windshield WipersSafety Connect (1-Year Trial Included)INTERIORPremium HDD Nav w/ Entune & JBL AM/FM CD w/ MP3/WMA, 8-inch high res screen, 14 Spkrs, SXM Radio with 90-Day Trial, USB, Bluetooth & Steering Wheel ControlsAuto 4-Zone Climate Control w/Air FilterMulti-Terrain Monitor; Center Cooler Box8-Passenger Perforated Leather-Trim Seats; 10-Way (w/ Memory) Dr & 8-Way Fr Pass Pwr, Htd & Vent Seats; Htd 2nd Row9-inch Rear DVD Entertainment SystemMECHANICAL & PERFORMANCE5.7L V8 DOHC 32V with Dual Independent VVT-i; 381 HP / 401 Lb.-Ft. TorqueFull-Time 4WD w/ A-TRAC and Torsen Locking Limited-Slip Center DifferentialKinetic Dynamic Suspension SystemMulti-Terrain Select; Hill-Start Assist Ctrl; CRAWL Ctrl w/ Off-Road Turn Assist18" Alloy Wheels with P285/60R18 Tires Vehicle is Certified by Toyota until 9/29/2019 which gives you a Limited Powertrain Warranty until that date or 100,000 miles. You will also get a 12 month or 12,000 Comprehensive Warranty. Certification includes a 160 point inspection and complete reconditioning. If you need financing the current Certified interest rate is 2.9% for up to 60 months. Call Tim @ 267.898.2713 for more info or to make an appointment. We can build your vehicle to your specifications, just ask us! We are the Delaware Valley’s one stop shop for all your Truck and Off-road ready vehicles. 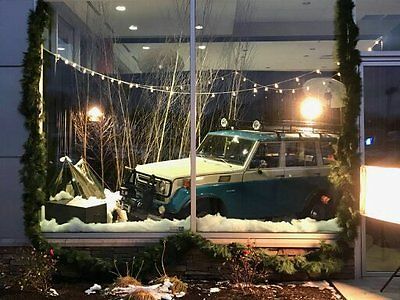 We have built countless Tundra, Tacoma and FJ Cruiser Crawler Package vehicles for our customers. From Lift-Kits, Tires and Wheels, Rock-Rails and Bumpers and even Super Chargers, we can outfit your vehicle for either the show circuit or for the trail. We can and have built our finely equipped vehicles to be shipped worldwide, we work with several shipping companies or we will work with yours. At Thompson Toyota in Doylestown, PA we will not meet your needs, we will exceed them.